They call it speech information rate, but it’s essentially the same: Pellegrine, F., Coupe, C., and Marsico, E. 2011. 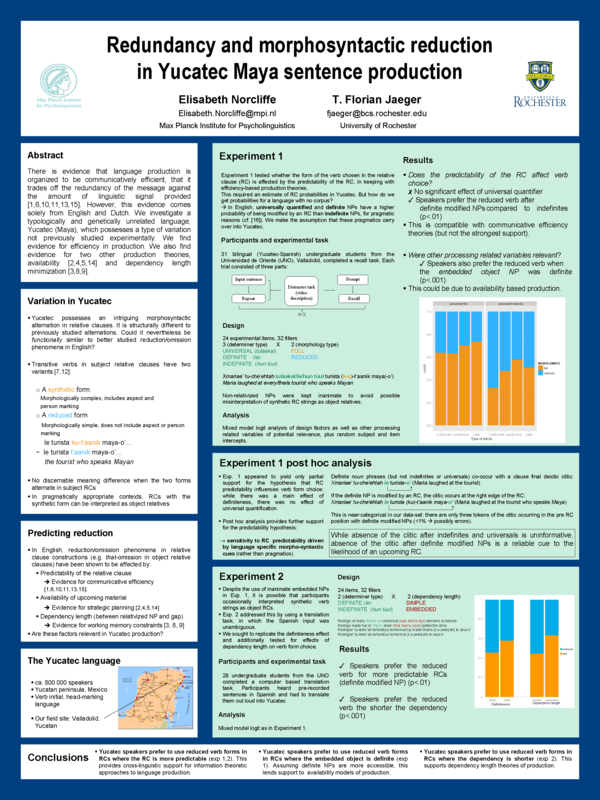 A cross-linguistic perspective on speech information rate. Language 87(3), 539-558. Maurits, L., Perfors, A., and Navarro, D. 2010. Why are some word orders more common than others. A uniform information density account. NIPS. S.T. Piantadosi, H. Tily, and E. Gibson. 2011. Word lengths are optimized for efficient communication.Proceedings of the National Academy of Sciences, 108(9):3526. This entry was posted in articles, Papers, Presentations, etc. and tagged information density, information rate, speech rate, syllables, uniform information density, word length, Zipf. According to Raja (the first author), more on this issue is in progress (e.g. an extension beyond complementizers) and future updates on this work will be posted on Michael White’s lab at Ohio State. This entry was posted in articles, Papers, Presentations, etc. and tagged complementizer, Rajkumar, text generation, uniform information density, White. 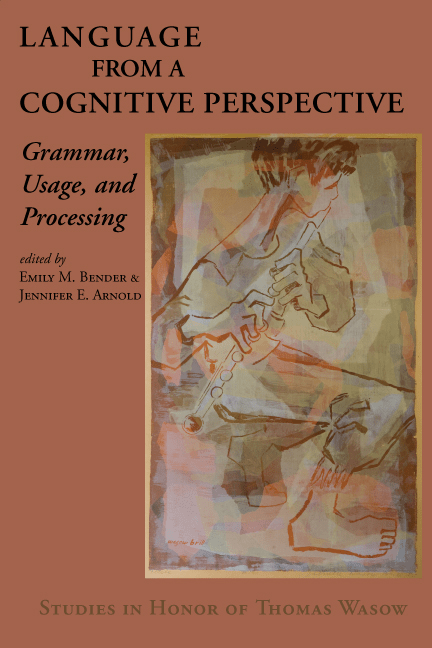 This book is a collection of papers on language processing, usage, and grammar, written in honor of Tom Wasow to commemorate his career on the occasion of his 65th birthday. Tom is a professor of linguistics and philosophy. But more accurately, he is a renaissance academic, having done work that connects with many different disciplines, including formal linguistics, sociolinguistics, historical linguistics, psycholinguistics, computational linguistics, and philosophy. Appropriately, this book reflects the diversity of Tom’s research and interests, including topics from multiple branches of linguistics and human information processing. These papers are written with minimal background assumed, so they can be used as teaching materials for beginning scholars. As such, this volume is a tribute to what is perhaps Tom’s most lasting contribution to the field—the mentorship and inspiration he provided to his students and collaborators, many of whom have contributed to this volume. The book contains introductory and overview articles on a variety of topics in cognitive science from Emily M. Bender, Dan Flickinger, Stephan Oepen, Ash Asudeh, Peter Sells, Amy Perfors, James Paul Gee, John R. Rickford, T. Florian Jaeger, Jennifer E. Arnold, Harry J. Tily, Neal Snider, John A. Hawkins, and Susanne Riehemann. This entry was posted in For students, Papers, Presentations, etc. and tagged corpus-based, psycholinguistics, reducible relative clauses, sentence production, syntactic corpora, tgrep2, uniform information density, Wasow, whiz deletion. Degen, J. and Jaeger, T. F. 2011. Speakers sacrifice some (of the) precision in conveyed meaning to accommodate robust communication. Talk to be presented at the 2011 Meeting of the LSA. The process of encoding an intended meaning into a linguistic utterance is well-known to be affected by production pressures. We present corpus data suggesting that the choice between even two seemingly non-meaning-equivalent forms as in (1a) and (1b) can be affected by speakers’ preference to distribute information uniformly across the linguistic signal (Uniform Information Density (UID), Jaeger 2006). This suggests that even when two forms do not encode the same (but a similar enough) message, speakers may sacrifice precision in meaning for increased processing efficiency. (1a) Alex ate some chard. Fedzechkina, M., Jaeger. T. F. , and Newport, E. 2011. Word order and case marking in language acquisition and processing. 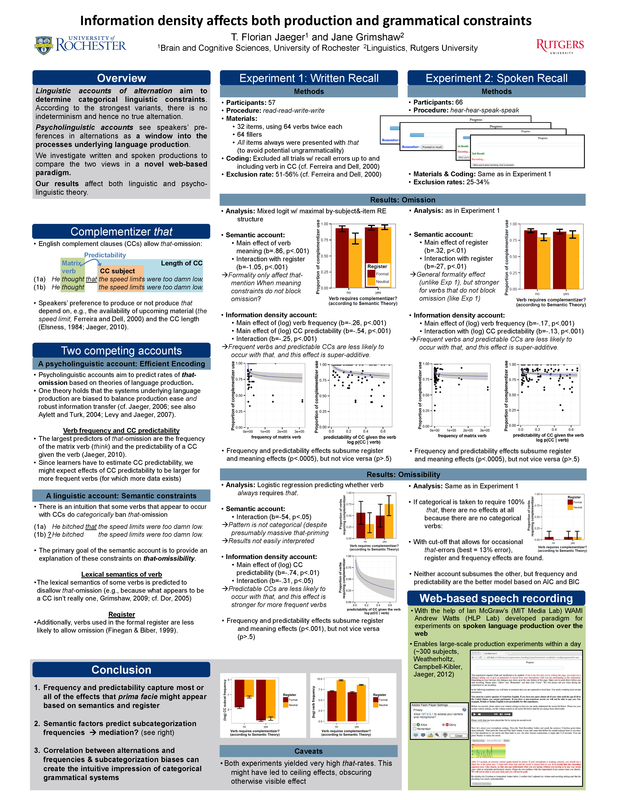 Poster to be presented at the 2011 Meeting of the LSA. Time: 9:00 – 10:30 AM. To understand a sentence, comprehenders must identify its actor and patient. In principle, these relationships can be signaled using a single cue, but most languages employ several redundant cues, including word order and case marking. In artificial language learning experiments we investigate word order and case as cues in processing and learning. In languages without case marking, learners regularize word order; but when case marking is present, it is favored and limits word order regularization. Case-marking comes with a disadvantage: it is more complex to acquire. But the present results suggest that this may be outweighed by clarity for processing. This entry was posted in Papers, Presentations, etc., presentations and tagged animacy, communication, Degen, Fedzechkina, LSA, Robin Melnick, uniform information density.